Valley Contax is proud to announce that we recently received 510(k) clearance by the U.S. Food and Drug Administration (FDA) for our Custom Stable line of scleral contact lenses indicated for the therapeutic management of several ocular conditions. To achieve this goal, the Custom Stable, which was manufactured in the Contamac line of Ultra High Dk, low-wetting-angle materials, went through a detailed clinical evaluation. The lenses were shown to effectively fit the eyes of patients who suffer from a multitude of ocular conditions, and also achieved clearance for the management of dry eye syndrome. Indications include the management of conditions such as degenerations that lead to an irregular corneal shape (e.g., keratoconus, keratoglobus, pellucid marginal degeneration, Salzmann’s nodular degeneration), dystrophies (e.g., Cogan’s dystrophy, granular corneal dystrophy, lattice corneal dystrophy), and corneal scarring. Indications also include post-surgery (e.g., corneal transplant, LASIK, radial keratotomy) use. The lens may also be prescribed for the management of ocular surface diseases (e.g., dry eye syndrome, keratoconjunctivitis sicca [graft-versus-host disease, Sjögren’s syndrome, filamentary keratitis], limbal stem cell deficiency, epidermal ocular disorders, neurotrophic keratitis, and corneal exposure/lagophthalmos). When prescribed for therapeutic use, the Custom Stable GP scleral lens is also indicated for correction of refractive error in persons with myopia, hyperopia, or presbyopia. The clearance designated that eye-care practitioners may prescribe the lenses for frequent/planned replacement wear, assuming regular cleaning, disinfection, and scheduled replacement. When prescribed for frequent/planned replacement wear, the lens may be cleaned and disinfected using a chemical (not heat) lens-care system. History:Keratoconus for nearly 40 years. Presented to my office in April 2015 with eye pain and blurry vision. Current small diameter RGPs were 12 years old and rubbing centrally causing 3mm abrasions and reducing vision to 20/70 in each eye. Dr Bundy (left), with the help of Valley Contax consultant Kelsey (right) and the Custom Stable Elite, was able to help DB overcome a multitude of long-standing vision challenges. I was just starting to fit scleral lenses and DB was one of my first patients when he first came to my office. Valley Contax consultant Kelsey answered nearly a dozen emails just for this one case alone.I would take videos of the lenses with an iPad and even a video of our OCT obtaining results and then upload them to YouTube with a private link for her to review. Kelsey could then educate me on what needed to be done and why. Because of Kelsey’s diligence and patience, I’m now comfortable taking care of patients needing Custom Stable Elite lenses for keratoconus, pellucid marginal degeneration, after corneal transplants, neurotrophic dry eyes and any other multitude of maladies. Device Parameters:Custom Stable Elite 15.8. Boston XO. Right clear. Left ice blue. Outcome: Perfect fit, vision and comfort. Vision improved from 20/40- to 20/20- in each eye. 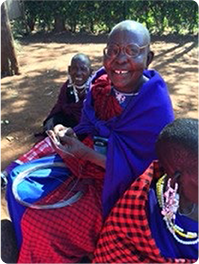 From The Patient: I would like to thank Valley Contax and the Custom Stable Elite lens for finally providing a comfortable and stable fitting contact lens.I have worn contacts since 1978 when my doctor found I was suffering from Keratoconus and glasses would no longer work to correct my sight. The old style lenses corrected my vision but moved a lot and often slid out of place. Also, living in Arizona the climate is often dry and windy making wearing contacts uncomfortable and often led to scratches on my eye surface which meant glasses until they healed, but glasses didn’t work so I was miserable. Since being fit with your lenses the discomfort of living in a dry and windy environment is almost a thing of the past and the lenses are so comfortable I often forget I am wearing them at all. I also haven’t had a surface scratch since I started wearing them almost two years ago. These are, by far, the most comfortable lenses I have ever worn and I would, and have, recommend them to others I know suffering with contact lens discomfort and issues that old style contacts can cause. 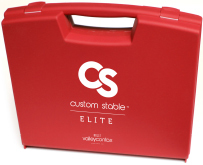 The Custom Stable is a very versatile and comprehensive scleral lens system. In this webinar you’ll learn how the Custom Stable system fits into everyday optometry. Scleral lens experts Dr. James Deom and Dr. Cory Collier will show you how to customize the Custom Stable for any eye that walks into your clinic.